Hi- I'm Carrie Ann Cole and I'm new here. Let me tell you a little bit about myself. I'm a personal chef and my newest assignment takes me from Chicago to London to cook for the Duke and Duchess of Cambridge and their two sweet babies. How did I get so lucky? Sometimes I have to pinch myself. 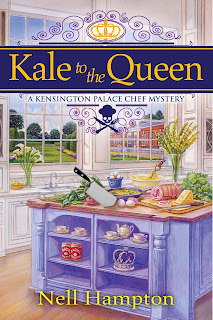 I mean what's a Midwestern girl doing cooking in the kitchens of Kensington Palace? It all started as a favor to a friend. She was scheduled to cater an event for the Duke and Duchesses' trip to New York City when she got the flu. So I flew in to save the day. That's where I met the famous couple and a few weeks later-to my surprise- I was offered a job. Now would you pass up an opportunity like that? I did have a long talk with my boyfriend before the move. John is also an up-and-coming chef. He decided we should take a break for the year that I'm under contract at the palace. I secretly hope to get him to come visit me in London and fall in love with the city. We could be international chefs. Secret hopes don't always work out. Then there's the dead man I found under the Kale beds. It turns out he's one of my cooking assistants and I'm was the last person anyone saw talking to him. Being an American at the Royal Court means there are several people who want me to be suspect number one. When my other assistant becomes suspect number two, things get complicated. With my assistants dropping like flies, I have to figure out how to keep the kitchen going and the meals on time. Butting heads with the Palace's Head Chef-Chef Butterbottom- doesn't help my cause. So much for a glamorous life at court. As you get to know me, you'll find out that complicated seems to be my middle name. If you had a chance to live in London would you take it? If so, what would you do there? Please leave a comment below. PS-my writer Nell Hampton is also known as Nancy J Parra and Nancy Coco. Sounds like an exciting read! I love Mystery books set in Europe! I hope I can read this soon. This sounds like a fun new series! I would love to visit London again. I was there once but only for a couple of days. I would love to visit all the quaint little bookshops that I've read about. This book sounds great. I have cousins in England so I would definitely jump at the chance to go if given the opportunity! This sounds like a wonderful new series. I love the idea of the young royals in the book. Looking forward to this new read. 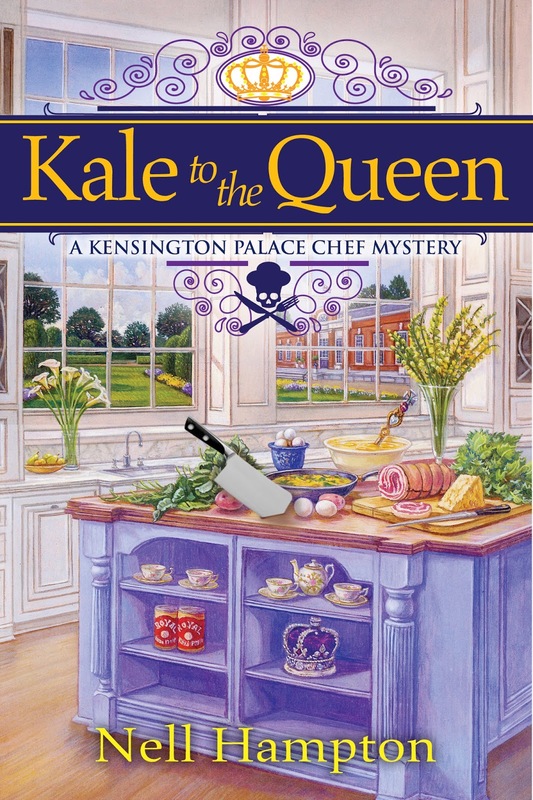 Kale and a palace are an interesting combination as well as being set in England. Having ancestors who have roots in England makes this book perk my desire to read. Thank you for including it in your blog. I like living where I am right now and plan to stay there. I'm definitely looking forward to this one. I love cooking cozies. Yes I would love to visit London and the rest of the British Isles as I have many friends who are citizens there. Would I take the chance to live in London? YES!!! What would I do? Everything! All the touristy stuff plus just have fun faking my way as a real Londoner. I am looking forward to this new series! Reading ALL YOU NEED IS FUDGE right now and enjoying it immensely, of course! Yes. I had an internship for 2 months in London & loved living there. Yes! I visited London for work a couple of times. But, you know, I had to work. I would delve into history and interesting things. Yes I would love to work in London and in a Museum which is my background. I would simply adore to catalogue and wander around the displays...book sounds great.. If I had the opportunity to go to London, I would definitely go. I would like to see all the tourist attractions that I've heard about: Westminster Abbey, Big Ben, Changing of Guard at palace etc. Living in London? A total dream of mine. Do? Being retired, I would be off doing everything: visiting every museum, historical site, British Landmark; popping in at every pub, tearoom, fish 'n chips shop; riding every form of transportation from cab, double decker bus, train; take selfies with Queen's Guard, a Bobbie, Big Ben! This sounds like a grand read!!! I would jump at the chance to go to London...or anywhere for that matter. My bucket list is lifetimes long. Maybe some day I'll be able to start chipping away at it. I'm looking forward to reading your book though. Living vicariously through characters is so much fun! I'd love to live in London for a year, and I would also enjoy the opportunity to see the English countryside. I would feel like I was in a novel or Agatha Christie mystery! I'd definitely have to visit Highclere Castle for a touch of Downton Abbey. I visited London and really loved it. If I had the chance I would move in a heartbeat. Who wouldn't!! London holds so much history and mystery, I'd love it!! I'd walk everywhere and learn everything I could. When I visited many years ago I went on several tours and did a lot of exploring by foot. The air feels different, the smells are different...awe, just amazing. Actually where I discovered my love of curry. Thank you London. I can't wait to read this book! Yes I would. I have a long list of things to do museums, art galleries and genealogy research.